Beowulf was a "dumb" artificial intelligence of the Office of Naval Intelligence. He was thorough, methodical and paranoid. 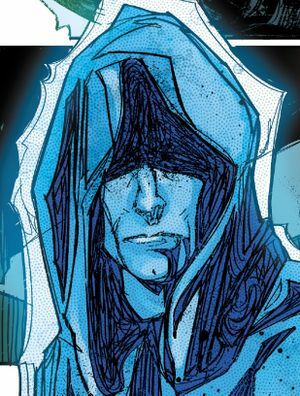 His avatar depicted a man in a hooded cloak. He served as the attaché to Vice Admiral Michael Stanforth, the head of the Office of Naval Intelligence's Section Three and safeguarded the United Nations Space Command's personnel and planning database. Beowulf was present during the SPARTAN-IIs' original briefing about the Covenant in the Reach FLEETCOM Military Complex's secure briefing room on September 12, 2525. Upon the instruction of Vice Admiral Michael Stanforth, Beowulf reluctantly presented the classified destruction of Harvest to the Spartans. He also broadcasted a message across the amphitheatre from the High Prophet of Regret, whom insisted that the destruction of humanity was the "will of the Gods". Afterwards, Beowulf left with Stanforth and Doctor Catherine Halsey. He was later assigned to guard the UNSC's personnel and planning database. He knew Cortana well and knew that she was potentially dangerous. During her attempts to hack into the system, Beowulf foiled her attempts. However, Cortana quickly overcame his defenses and accessed SPARTAN John-117's Career Service Vitae. As Beowulf served as Vice Admiral Stanforth's personal attaché, it is possible that the AI was destroyed when Stanforth was killed during the Fall of Reach on August 30, 2552. Beowulf is named after the titular character of the famous heroic poem Beowulf, the only surviving piece of ancient Anglo-Saxon heroic poetry.